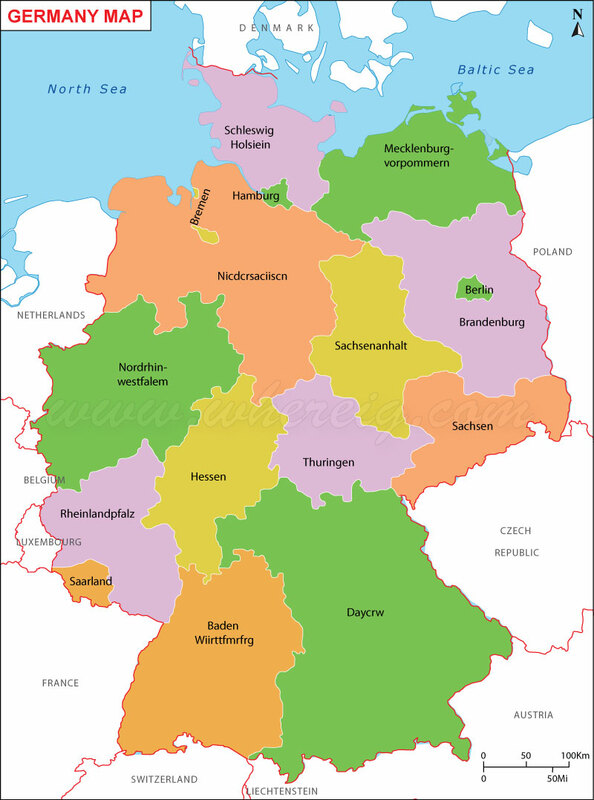 Description: The Political Map of Germany showing Germany States, cities, capital, international and state boundaries. Officially known as the Federal Republic of Germany. Germany is the seventh largest country in Europe by area, located in the western and central part of Europe, and is bordered by nine countries: Denmark, Poland, Czech Republic, Austria, Switzerland, France, Luxembourg, Belgium, and the Netherlands. The important cities of Germany are Berlin, Frankfurt, Nurnberg, Stuttgart, Hanover, Hamburg, Bremen, and Dusseldorf.